Star Wars zips and zaps into theaters this weekend, and I was lucky enough to see it last night with a hugely excited crowd who screamed, laughed, and applauded at all the right moments. It was a wonderful theatrical experience for a truly wonderful movie—one worthy of its years-long hype and the Star Wars name itself. And though I don’t want to spoil any of the plot for you or reveal some of its many surprises, I do want to talk about one thing: BB-8. 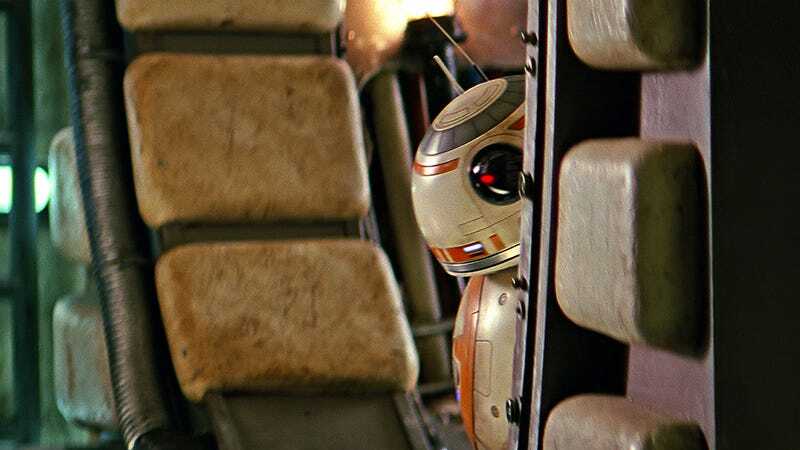 BB-8 is a very special droid who, in many ways, is the most important character in the movie. BB-8 made me laugh. BB-8 made me gasp. BB-8 made me squeal. BB-8 is what I want for Christmas. BB-8 is the cutest thing I have ever seen. What I felt for BB-8 is what I imagine people felt for R2-D2 after seeing A New Hope for the first time in 1977. Only, you know what? I’m just going to go out on a limb here and say BB-8 is better than the former Cutest Droid In the Galaxy in every way. BB-8 moves more quickly. BB-8 can never fall over because BB-8 is a ball. BB-8 has a kinder, more emotive voice. Not only do I understand how parents feel when they say their baby is the cutest one they’ve ever seen, I think BB-8 is cuter than any baby I’ve ever seen or probably will ever see. Though you may believe children are our future, I believe—after seeing BB-8—that children are most definitely our past. I want to adopt BB-8. Here’s my favorite conversationalist again. Ugh, just look at it. “Oh? Where exactly is his house?” I’d ask with the smile of someone who would never hurt a fly. I’d smile while picturing Carrie Fisher, my close friend, sneaking into J.J.’s home earlier that week and pouring a gallon of bacon grease down J.J. Abrams’ kitchen sink simply because I told her to, and without ever asking why. She’s a good egg, that one. A real pal. He’d direct me to the home’s beautiful kitchen and I’d marvel at the gas range. I’d wonder if BB-8 had ever watched J.J. cook a meal there, and imagine myself cooking in BB-8’s presence. Its head tilting as I chopped. Giving an approving beep after I pull out a perfectly roasted chicken. Ina’s recipe. BB-8 knows. After dropping my empty toolbox I’d run to the basement—second door past the guest bathroom, just like Carrie told me—and tiptoe down the stairs. Once illuminated by a single bulb, I’d notice all of J.J.’s treasures. A miniature Starship Enterprise. Framed promotional posters for the first season of Lost. A real doll of Steven Spielberg. And then, just beside the giant Felicity wig, I’d see my precious BB. Waiting patiently for his friend. Now where’d I put that bag? Wow, J.J. is fast! Who would have thought. But I’m faster, at least for now. I carry BB-8 in a terrycloth bag slung over my shoulder. It’s heavier than I’d expected and, so far, hasn’t said a thing to me, but I’m ready to take it home. To have our first chat. I’m ready to do anything for BB-8. I’m ready to make the jump over the fence. I’m ready. I’m ready. I’m ready. J.J. has tackled me. I let out a deep moan as BB-8 rolls on to the wet grass, its panels still unlit. “The cops will be here in 5 minutes you jackass,” J.J. says. But I don’t respond. I turn my head to BB-8, the friend I’ll never have. How strange it is to notice there’s no life in either of us.